… no matter how advanced their dementia. We want people to feel differently about dementia. Our mission is to Inspire Different Conversations about dementia. 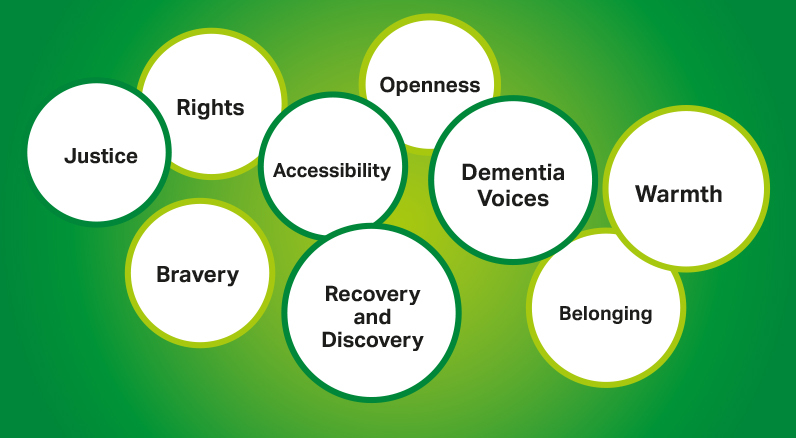 We work with and alongside people with dementia to shape practice, policy and attitudes. We are committed to justice – We care deeply about human rights, inclusion and accessibility for people with dementia. Innovations in Dementia is an organisation built on warmth. Being loyal and respectful to those we work with is key to our work. We aim to demonstrate openness in everything we do. We are open to growth, to the wonder of potential, and to new ideas, opportunities and challenges. We are a brave organisation. We are prepared to disrupt the status quo with our ideas and actions, and to persistently support people with dementia to challenge and get what they want.